Fourth position overall and a third place in the first moto of the Grand Prix of the Netherlands at a cold and breezy Valkenswaard circuit showed that Max Anstie and the Rockstar Energy Suzuki Europe team are pushing their 2013 FIM Motocross World Championship term on the right path. Some 27,000 spectators shivered through sunny conditions but with a wind chill factor of almost zero degrees. The Dutch sand showed obvious signs of the 'artic climate' over Easter weekend as the terrain was slippery and frozen during the morning sessions and lessened the quantity of rutted and technical bumps through the many turns and jumps. But the course was still a special test of nerve and machine set-up. Anstie and team-mate Julien Lieber blasted out of the gate for two excellent starts inside the top six in the first moto, using the power of their RM-Z250s to full effect. The Brit maintained a steady speed, holding second for the first five laps of the race and then circulating a safe third behind Jeffrey Herlings and Jordi Tixier. Lieber was not far behind: The young Belgian pushed to keep inside the top six and secured 15 points by the wave of the chequered flag. The second moto start saw the Suzuki duo tucked deeper into the 40-strong pack. Anstie strove towards sixth position; a ranking that saw him miss the overall podium by three points. Lieber was unlucky not to make the finish after two crashes, but was fortunate to leave Valkenswaard without injury as Jose Butron smashed the #33 RM-Z as the teenager was trying to retrieve the fallen motorcycle the second time. The damage from the collision was extensive and Lieber was forced to retire. Anstie is currently sixth in the MX2 standings while Lieber is 10th. In two weeks Rockstar Energy Suzuki Europe will roll into the paddock of Arco di Trento for the Grand Prix of Italy and then head straight to Sevlievo seven days later for the Bulgarian round. "We did a lot of work in the last couple of weeks but it was all at Lommel and then we come here and the sand is frozen and hard! We were searching all weekend for the right setting and we were also testing a few little bits and pieces, trying to bring it together but it didn't really happen. I had a good start in the first race and ran my pace. We are getting there and this should have been a top-five no problem. I'm not tired physically but I couldn't really ride like I wanted to today. All we can do is keep working and I know we are close. We'll go again in a couple of weeks." "The first race was pretty good and the start was perfect. I finished sixth and felt a bit tired with some back pain so I wasn't sure what to expect in the second moto. My start wasn't as good and I was behind Banks-Browne in the top 10 when I crashed and then fell again. I was picking up my bike when I saw the other riders coming and had to let it go. It was in no state to ride after it had been hit. I'm really lucky that I'm OK. The track was difficult today." MX2 Moto1: 1. Jeffrey Herlings (NED, KTM), 39:49.179; 2. Jordi Tixier (FRA, KTM), +0:11.056; 3. Max Anstie (GBR, Rockstar Energy Suzuki Europe), +0:21.337; 4. Jake Nicholls (GBR, KTM), +0:22.824; 5. Glenn Coldenhoff (NED, KTM), +0:24.088; 6. Julien Lieber (BEL, Rockstar Energy Suzuki Europe), +0:58.146; 7. Jose Butron (ESP, KTM), +1:01.127; 8. Petar Petrov (BUL, Yamaha), +1:09.946; 9. Priit Ratsep (EST, KTM), +1:11.786; 10. Mel Pocock (GBR, Yamaha), +1:15.897. MX2 Moto2: 1. Jeffrey Herlings (NED, KTM), 39:47.473; 2. Jordi Tixier (FRA, KTM), +0:07.845; 3. Jake Nicholls (GBR, KTM), +0:12.739; 4. Glenn Coldenhoff (NED, KTM), +0:21.467; 5. Romain Febvre (FRA, KTM), +0:45.622; 6. 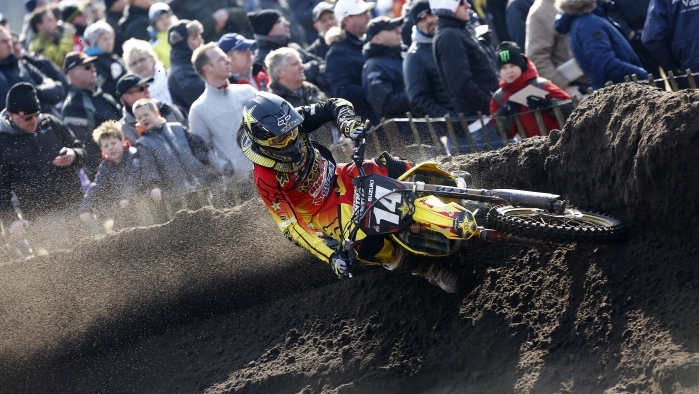 Max Anstie (GBR, Rockstar Energy Suzuki Europe), +1:08.635; 7. Elliott Banks-Browne (GBR, KTM), +1:12.868; 8. Alexander Tonkov (RUS, Honda), +1:15.878; 9. Mel Pocock (GBR, Yamaha), +1:19.983; 10. Pascal Rauchenecker (AUT, KTM), +1:25.293; 29. Julien Lieber (BEL, Rockstar Energy Suzuki Europe). MX2 Overall: 1. Jeffrey Herlings (NED, KTM), 50 points; 2. Jordi Tixier (FRA, KTM), 44 p.; 3. Jake Nicholls (GBR, KTM), 38 p.; 4. Max Anstie (GBR, Rockstar Energy Suzuki Europe), 35 p.; 5. Glenn Coldenhoff (NED, KTM), 34 p.; 6. Alexander Tonkov (RUS, Honda), 23 p.; 7. Mel Pocock (GBR, Yamaha), 23 p.; 8. Priit Ratsep (EST, KTM), 22 p.; 9. Pascal Rauchenecker (AUT, KTM), 19 p.; 10. Romain Febvre (FRA, KTM), 16 p.; 11. Julien Lieber (BEL, Rockstar Energy Suzuki Europe), 15 p.
MX2 World Championship Standings (after 3 of 18 rounds): 1. Jeffrey Herlings (NED, KTM), 150 points; 2. Jordi Tixier (FRA, KTM), 101 p.; 3. Romain Febvre (FRA, KTM), 98 p.; 4. Glenn Coldenhoff (NED, KTM), 97 p.; 5. Jose Butron (ESP, KTM), 74 p.; 6. Max Anstie (GBR, Rockstar Energy Suzuki Europe), 72 p.; 7. Christophe Charlier (FRA, Yamaha), 71 p.; 8. Dean Ferris (AUS, Yamaha), 69 p.; 9. Jake Nicholls (GBR, KTM), 64 p.; 10. Julien Lieber (BEL, Rockstar Energy Suzuki Europe), 62 p.